A deal has been agreed in the long-running dispute over a new junior doctors' contract in England. Health Secretary Jeremy Hunt said the deal was a "significant step forward", while the BMA said it represented the "best and final way" to end the row. The offer will now be put to a vote of over 40,000 BMA members. Junior doctor deal: Which side has won? Analysis: The beginning of the end? The fact that something has been agreed is a major breakthrough. But this dispute is still a long way from being over. 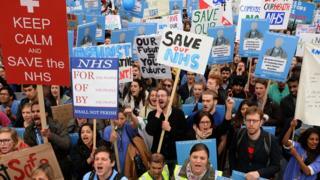 The BMA has promised its 40,000 members a vote on the agreement. That will be carried out in June and there are no guarantees the membership will give it the green light. Junior doctors have been incredibly united throughout. Some 98% voted in favour of taking strike action last autumn and whenever union leaders have taken soundings since, the overwhelming sense has been that they have wanted to fight on. If this hadn't been the case the leadership would probably have agreed a deal long before now. What will be interesting, and perhaps crucial, is just how strongly the BMA leadership tries to sell the agreement to members in the coming weeks. BMA junior doctor leader Dr Johann Malawana said he was pleased to have reached a deal after "intense but constructive talks", adding it was the "best and final way" of resolving the dispute. "What has been agreed today delivers on these principles, is a good deal for junior doctors and will ensure that they can continue to deliver high-quality care for patients." He said he would be recommending the deal to junior doctors ahead of the vote of BMA members, which will be run in June. Mr Hunt said: "We welcome this significant agreement which delivers important changes to the junior doctors' contract necessary to deliver a safer seven-day NHS.